Flexible displays – is no surface safe? There was a time when you could pretty much guarantee that a display surface for a moving image had to be flat – or at the very least, flat-ish. All of that certainty went out of the (flat) window with the advent of flexible electrophoretic plastic displays. Now, any surface, no matter what its shape, whether it’s a single plain or three dimensional, can be turned into an advertising hoarding, a display or even a work of electronic art. 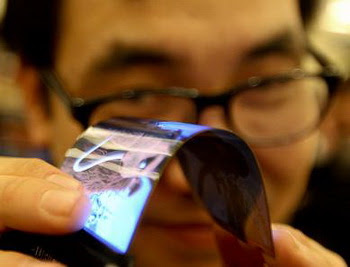 So what are the possible applications for flexible displays, and do we really need them? that may be a little more familiar in term – e-paper. The advent of e-paper has revolutionised applications such as e-readers and e-books, and companies such as Plastic Logic are now investigating other applications for this technology. dark dye is added, as well as charging agents that give the particles an electric charge. This mix is then sandwiched between two parallel conductive plates with a very tiny gap in between. When an electric current is applied, the particles will line up electrophoretically (hence the name) to the plate with the opposite charge to themselves (in the same way that opposite poles of a magnate attract). Depending on the positions of the particles, the result on screen will either be dark or light, and through this lettering can be created. readers incorporated this technology into a useable form back in the early 2000s, and now leaps forward in colour images and more complex results are being achieved, making this kind of technology ideal for display purposes. It’s not just advertising applications that are ideal for flexible EPDs. Larger versions could have specialist applications such as billboard advertisements and even 3D advertising platforms, but smaller versions of the same technology could be incorporated into mobile and communications technology, such as wireless flexible screens for smartphones. They can also find a use in more everyday arenas, such as displaying timetables at bus stops, or menus in restaurants. EPDs have several advantages over LED displays. Primarily, they can be instantly changed to display any message or image, but they are also incredibly lightweight, robust, easy to read in daylight and are exceptionally power-efficient. Multiple displays can be put together to produce large scale displays, making them perfect for temporary displays at events and conferences. The technology could also be used in other areas, such as in packaging and even on clothing – although this may be more of a passing fashion than a truly practical application! Our concept of how we use space to transmit a message in the digital age has to change in line with the advances in technology, and flexible EPDs are right at the cutting edge of electronic display systems. Their flexibility and robust makeup makes them incredibly adaptable and the applications are only limited by the user’s imagination. While we may not want to see even more advertising in our environment, the continuing development of more advanced flexible EPDs suggests that we may have to accept that it will be a fact of life in the future. Author Bio: Carolina Green is interested in everything related to tech, especially tablets and phones. When I'm not researching the internet I like to spend time in the gym and being active outside.